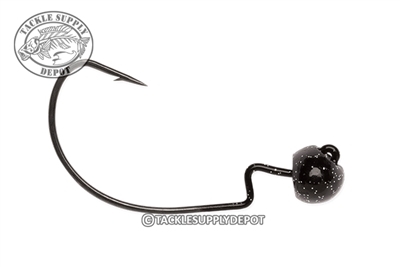 Designed by 2003 Bassmaster Classic Champion and 2006 Angler of the Year, Michael "Ike" Iaconelli, the VMC "Ike Approved" Rugby Jig features a unique head that is a actually a cross between a round head and football head. Shaped just like a rugby ball, hence its name, it is one of the most versatile jig heads possible. You can fish it over rocks or gravel, through weed, around boat docks, anywhere you can think to throw it, and it imparts a killer side-to-side, rolling action to your bait. Its offset hook also allows you to Texas-rig soft plastics and its extra wide gap and super sharp point allow it to accommodate any style of soft plastic, while also increasing your hook up ratio. A recessed line eye even protects against snags, weeds, and abrasion from underwater obstacles.